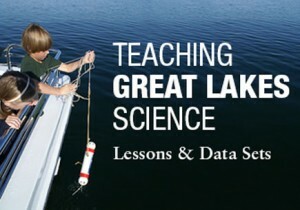 This website features a suite of lessons, activities and data sets all focused on Great Lakes science, technology, engineering and math. Topics include fish, food webs, Great Lakes and you, habitat, invasive species, water properties, water quality and quantity, and weather and climate. This we bsite contains free, downloadable education and outreach materials for people of all ages to learn about marine debris. Everyone has a role to play in raising awareness about the problem. This w ebsite includes a variety of lessons and activities in the following topics: Ocean and Coasts, Climate, Weather and Atmosphere, Marine Life, Fresh Water and Special topics. This site inclu des information and resources on teaching climate science, maps and data, news and features, and supporting decisions. This websit e is a collection of 14 activities connecting Great Lakes and ocean science topics to enhance teacher capabilities for accessing science information in Great Lakes and ocean sciences. A varied range of instructional modes is offered, including data interpretation; experimentation; simulation; interactive mapping; and investigation.